The Department of Sport Management offers a Bachelor of Science (B.S.) in Sport Management, a Bachelor of Science (B.S.) in Sport Analytics, a Master of Science (M.S.) in Sport Venue & Event Management as well as four minors: Sport Management minor, Sport Analytics minor, Sport Venue and Event Management minor; and Sport Revenue Management and Operations minor. In conjunction with the School of Education, Sport Management also offers a Certificate of Advanced Study (CAS) in Intercollegiate Athletic Advising & Support. Students learn from courses in areas including sport business, sales, sport psychology, research methods, sport economics, technology in sport, data analysis, management, finance, marketing, law, promotion, communications, event planning and facility management. The Department of Sport Management accepts applications for students interested in an Intra-University Transfer. The 124-credit hour B.S. in Sport Management incorporates studies in arts and sciences with professional electives and liberal arts requirements, providing students with the tools to pursue careers and graduate study in sport. Department specific coursework includes marketing, management, communications, finance, and law. The degree allows students to pursue a concentration or minor to tailor their studies according to their professional interests. Syracuse University Athletics with on-campus internships in athletic communications, marketing, special events, team sport managers, development and facilities management. Women in Sports and Events (WISE), a national organization focusing on leadership, special events and networking skills. Syracuse University is honored to be the inaugural collegiate chapter of WISE. Thinking about coming to SU or becoming a donor to our program? View a video from Sport Management major Anthony de la Fuente ’19. “Falk has sparked an insane amount of motivation I didn’t know I had. 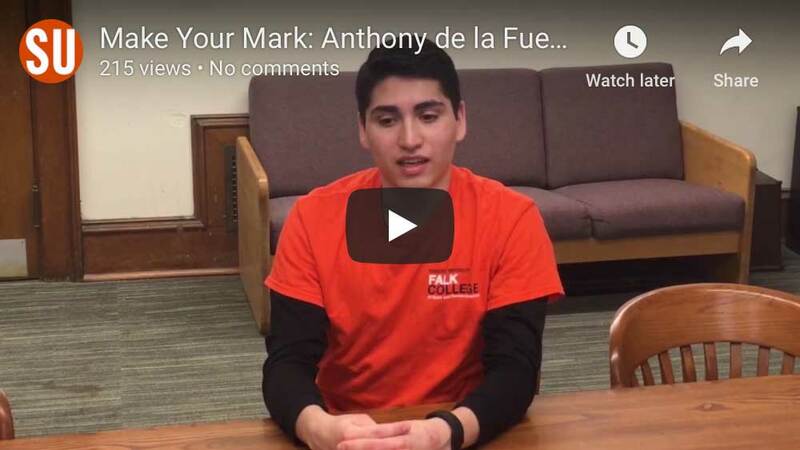 Having faculty who genuinely care about the students here at Falk creates an electric atmosphere, and so much motivation has come out of that.” De la Fuente shares how donors to the David B. Falk College of Sport and Human Dynamics have allowed him to expand his education at Syracuse University. Current Syracuse University students (including David B. Falk College of Sport and Human Dynamics students) interested in an Intra-University Transfer into Sport Management should review the transfer criteria below and complete an SPM IUT application form. Intra-University Transfer Policy Deadlines are: November 1 for Spring entry and March 1 for Fall entry. A student must have a minimum overall GPA of 3.5. In order to complete the SPM degree requirements within a four-year plan of study, SU students must have a minimum of five remaining semesters of study. Students must have completed a minimum of 24 credit hours at Syracuse University. It is required that applicants have completed SPM 205, or be enrolled in the course when applying. It is also highly recommended that applicants take an SPM elective prior to applying. Students must complete and submit an SPM Intra-University Transfer application. Students must submit a resume. A personal interview with the SPM transfer committee may be arranged by the department after the IUT application deadline. Please understand that while careful consideration will be given to all students who meet the outlined criteria, acceptance into Sport Management can only be granted on space availability, based on current enrollment. 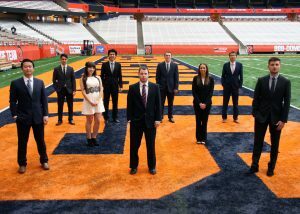 Why choose Syracuse University’s Sport Management program? The 125-credit hour Bachelor of Science in Sport Analytics incorporates studies in arts and sciences with professional electives and liberal arts requirements, providing students with the tools to pursue careers in sport analytics. With growing numbers of sport organizations embracing data analytics’ powerful role in understanding and prioritizing information to maintain a competitive advantage, there is increasing demand for sport analytics professionals to guide data-driven decision making. 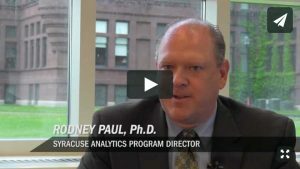 Syracuse University’s Falk College now offers a Bachelor of Science (BS) in Sport Analytics—the first undergraduate program of its kind in the country established within a professional sport management program—to provide students with a deep understanding of math, statistics, research methodology, sport economics, database management, finance, and computer programming integral to sport analytics. The new degree also incorporates a mandatory foreign language requirement to prepare students for the global sport industry. The program will prepare students for a variety of different analytics career paths on the player evaluation and/or business sides of sports. What the future holds for the still very young discipline of sport analytics. The new degree incorporates a mandatory foreign language requirement to prepare students for the global sport industry. “Sport industry executives repeatedly tell us that students who are bilingual are highly sought after, especially in growth areas including South America, China and India,” says Falk College Dean Diane Lyden Murphy. The announcement of the new degree follows a two-year process of analyzing changes in the industry, including in-depth interviews with senior-level sport executives and practitioners, in careful consultation with Falk College’s Sport Management Advisory Board made up of company presidents, founders, CEOs and other top-level executives. Computers/IT – Programming, Databases, SQL, R, Python, Web scraping, Data Mining, etc. Also other courses in writing, finance, sport management, communications, etc. Sport Data Analysis I and II – Applied Econometrics using examples from the player/team and business side of sports. A variety of techniques, models, and skills are covered over two semesters. Sports Economics – The theory and models behind the business of sports. Price Theory in Sports – Advanced Sports Economics – covers topics such as variable pricing, dynamic pricing, attendance and concessions models, etc. Research Methods – background on how to conduct research in sports. The senior thesis encompasses a two-semester deep dive into the sport (or sports) of your choice. 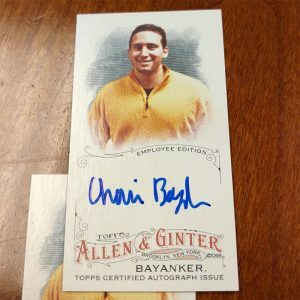 Topic could be on the player-side, team-side, business-side, or a combination as it relates to the sports industry. Thesis centers on an original idea of which the students will conduct background research, gather data, create models, run statistical relationships, visualize the relationships, and explain the results across a variety of formats (research paper, webpage, blog, oral presentation, etc.). Students will work one-on-one with a professor in the program to perform analytical research and analysis. Intra-University Transfer CriteriaCurrent Syracuse University students (including Falk College of Sport and Human Dynamics students) interested in an Intra-University Transfer into Sport Analytics (SAL) should review the transfer criteria below and complete an SAL IUT application form. Deadlines to apply: November 1st for Spring entry; March 1st for Fall entry. A student must have a minimum cumulative GPA of 3.5. In order to complete the requirements of the Sport Analytics degree within a four-year plan of study; students must have a minimum of five remaining semesters of study. Students are encouraged to have completed a minimum of 24 credit hours at Syracuse University, including the following courses: SPM 205; MAT 221, ECN 203 and foreign language coursework. Students must complete and submit an SAL Intra-University Transfer application. A personal interview with the Sport Analytics transfer committee may be arranged for qualified students based on the qualifications listed above. Please understand that while careful consideration will be given to all students who meet the outlined criteria, acceptance into Sport Analytics can only be granted on space availability, based on current enrollment. Hundreds of broad-based sport management master’s degree programs exist that provide students with an overview of content across a number of topic areas. The problem with such a model is that students in these graduate programs may not get the focused specialization in any one area they need to successfully launch their sport industry careers. Syracuse University’s Master of Science degree in Sport Venue and Event Management (SVEM) was designed uniquely to provide students with a specific knowledge and skill base in managing and operating sport and entertainment facilities and events. If you have a career interest in this area, here is why the SVEM program may be the perfect platform to launch your career in sports venues and events. Students visit Celtics executives at TD Garden in Boston. The Foundations course is designed to provide an overview of the sports industry with an emphasis on venues and events, as well as a focus on sports industry career exploration and planning. This course has recently included a field trip to the NASCAR race in Watkins Glen and a “speed networking” event to help build students’ networks among area sports industry professionals and lead to potential internship opportunities. Our Event Management course gives students an understanding of the planning and execution of sporting events of many sizes and scopes. Students in this course spend three days in New York’s picturesque Finger Lakes region assisting in the operations of the Musselman Triathlon, providing an opportunity to put into practice lessons learned in the classroom. Fall Semester Students take a full course load in the fall and spring semesters while also identifying internships to gain experience in venue and event management. The fall semester contains an immersion trip where students travel with faculty to visit sports venues and events to make industry connections leading to future employment opportunities. The Facilities class offers an overview of the design and operations of sports facilities, including arenas and stadiums. Students in this class recently used Syracuse’s Carrier Dome as their classroom all semester and conducted an analysis of the customer path for Carrier Dome events. Students presented actionable findings from their analysis to senior administrators upon completion. An understanding of marketing and revenue generation concepts is vital to practitioners throughout the sports industry. Our Marketing course involves conducting market research for a sports organization and then utilizing the findings of that research to create a marketing plan to present to the sport organization’s leadership. The Management course was recently added to the SVEM curriculum as a result of feedback from our students and alumni working in sports facilities and events. This course focuses on both leadership and human resources management in an effort to prepare students for careers in the management of sports facilities and events settings. Students have the opportunity to customize their degree by taking elective courses in areas of their specific career goals. The SVEM program was designed in collaboration with SU’s School of Information Studies (iSchool), S.I. Newhouse School of Public Communications, and the Martin J. Whitman School of Management. Each of these programs is among the national leaders in their respective disciplines, allowing SVEM students to maximize their education experience at Syracuse University. Spring Semester Students take a full course load and gain experience outside the classroom. The search for the summer final practicum begins in earnest early in the spring, with many students choosing to complete three credits of practicum experience in the spring semester while searching for their final practicum that summer. Comprehending finance, budgeting, and economic principles is essential to the management of sports facilities and events. 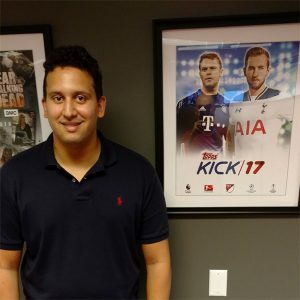 The sports industry is becoming more data-driven on a daily basis, which is the focus of this class. Students in the Advanced Events course apply what they’ve learned throughout the SVEM curriculum to the planning and implementation of an actual sports-related event, which the students themselves design. Students have the opportunity to customize their degree by taking elective courses in areas of their specific career goals. Among the most valuable facets of the Department of Sport Management is its connection with the sport industry, which plays out in numerous ways, including internships, visiting lecturers and guest speakers. As part of their degree requirements, SVEM students complete practicum credits to gain valuable hands-on experience in the sport industry. Second Summer Semester The program culminates in the final practicum, intended to launch students into a career in sports venue and event management. Among the most valuable facets of the Department of Sport Management is its connection with the sport industry, which impacts students in numerous ways, including the practicum. As a part of their degree requirements, Sport Venue and Event Management graduate students must complete a 9-credit Practicum providing an opportunity to gain valuable hands-on experience in the sport venue and event management industry before graduation. Dr. Rodney Paul – Paul is a sports economist and one of the most prolific scholars in the sport management discipline. His research has been published in journals and textbook all over the world. Dr. Gina Pauline – Pauline teaches the event management courses in SVEM, where she brings expertise as both a scholar and an industry professional, having managed championship events for two collegiate athletic conferences. Dr. Jeff Pauline – Pauline is the director of the SVEM program. He is a certified consultant of the Association for the Advancement of Applied Sport Psychology. He has consulted with a variety of amateur and professional athletes and teams. His consultations have focused on performance enhancement, team building, stress management, and creating balance between mind, body and spirit. Dr. Patrick Walsh – Walsh teaches the marketing sport venue management course in SVEM, where he brings expertise as both a scholar and an industry professional, having worked for the Buffalo Bills and Velocity Sports and Entertainment (now Team Epic). 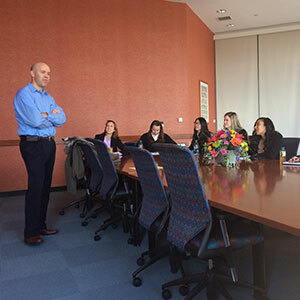 Additionally, students have the opportunity to connect with other Department of Sport Management faculty such as Michael Veley, SPM Department Chair and former senior administrator in college athletic departments at Cornell, Illinois, and Syracuse. A Class of 2014 student presents to Carrier Dome management. Each SVEM annual cohort consists of less than 20 students. These cohorts benefit from small class sizes, allowing a dynamic interactive learning environment. Throughout the curriculum, students work frequently in teams to collaborate on industry-based projects. Outside the classroom, students benefit from small faculty-to-student ratios in advising and mentoring opportunities. 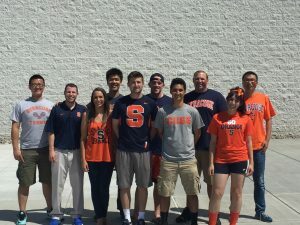 This attention also extends far beyond the year on campus in our program, as our students are forever members of the Syracuse University family and proud alumni of the SVEM program and David B. Falk College of Sport and Human Dynamics. Students meet with Philadelphia Phillies executives during an immersion trip. SVEM faculty and staff emphasize the importance of career planning from the first days of the program’s start each summer. This one-year program goes by quickly and students are pushed to maximize every chance to take advantage of opportunities provided. Early in the program, students are encouraged to explore different career opportunities related to sports venues and events, but our philosophy is that students should identify a specific area of interest and work with our faculty and staff to execute a plan toward pursuing that career path. Ultimately, our SVEM philosophy is that the student must take ownership of their own individual career pursuit, and our role as the program, faculty, and staff is to work alongside students in that pursuit using a combination of teaching, advising, mentoring, and leveraging industry connections to assist students in their quest for fruitful careers related to sports venues and events. Some of the specific activities built into the program toward facilitating students’ career development include networking events, immersion trips, career matching, and workshops on areas such as resumes, salary negotiation, and networking. Additionally, our program has developed strong partnerships, both locally with area facilities and events, as well as nationally and globally, with organizations like Aramark, AEG, and Disney Sports, to help students pursue sports industry careers. If your career aspirations are focused on sport facilities and events, we believe you’ll find no program better able to educate, mentor, and assist you in launching your career in these areas. Please find information below about the admissions process and on contacting us for more information. The SVEM Club seeks to provide students with specific knowledge and experience focused on managing and operating sport and entertainment facilities and events. The Certificate of Advanced Study (CAS) in Intercollegiate Athletic Advising and Support is a joint 15-credit hour certificate program offered by Syracuse University’s Falk College and School of Education. It is designed for current and future higher education professionals (e.g., advisors, higher education/student affairs administrators, and coaches) who wish to understand the research, practice, and policy perspectives associated with intercollegiate sport and student-athlete development in the context of higher education. The program includes coursework in the following focus areas: how colleges and intercollegiate athletics work, theoretical perspectives of college student development and learning, the impact of race, gender, and class on college student-athlete access and success, and foundations of advising student-athletes. Designed to prepare professionals who work with large numbers of student-athletes in higher education or specifically in the advising and support units within college athletics, students will gain a comprehensive understanding of the developmental, psychosocial, and emotional perspectives and needs of intercollegiate student-athletes and apply their understanding of the complex issues and roles of intercollegiate sport in their future work as professionals in higher education. With the high visibility of intercollegiate athletics and questions around the academic preparation, progress and success of student-athletes, there is a clear need for graduate study and professional knowledge around policy, research and best practice in higher education and in intercollegiate sport, specifically in the area of athletic advising and support services. For questions about the CAS, contact Cathy McHugh Engstrom, Ph.D., Associate Professor, School of Education, Syracuse University, 350 Huntington Hall, at 315-443-4763 or cmengstr@syr.edu. For more information about our graduation rates, the median debt of students who completed the program, and other important information visit the Syracuse University Gainful Employment Disclosure page. The 18-credit minor in Sport Management is designed for students who are interested in pursuing a career path in the sport industry along with their chosen major. Students selecting this minor in sport management should have an interest in learning about the business, communications, marketing, event planning, economic, global, and legal aspects of the sport industry. Dr. Jeffrey Pauline serves as the minor coordinator and can answer questions relating to the minor. Email Dr. Pauline at jspaulin@syr.edu or call 315-443-2630.
declare a minor no later than the first semester of junior year. Deadlines for applying for the minor are November 1 for spring admission and April 1 for fall admission. have completed a minimum of 30 credits at Syracuse University in courses graded A-F.
Print and complete the Minor Declaration Form (PDF). (keep in mind the November 1 and April 1 deadlines). If your application is approved, you will be notified via e-mail AFTER semester grades are posted. Plus 15 credits of additional Sport Management courses, 12 credits of which must be 300-level or above. Dr. Jeffrey Pauline serves as the minor coordinator and can answer questions relating to the minor. Email Dr. Pauline at jspaulin@syr.edu or call 315-443-2630. The 18-credit minor provides students with the tools to pursue careers in sport analytics. With growing numbers of sport organizations embracing data analytics’ role in understanding and prioritizing information to maintain a competitive advantage, there is increasing demand for sport analytics professionals to guide data-driven decision making. The 18-credit minor provides students with the tools to pursue careers in sport venue and event management. Understanding that the sports industry seeks employees with a specialized skill set, this minor is designed to provide a set of courses focused on the management and operations of facilities and events in the realm of sports and entertainment. Students will study stadium/arena management, events production and programming, and venue food, beverage, and hospitality. The 18-credit minor in Sport Revenue Management and Operations is designed for students who are interested in pursuing a career in the sport industry with a specific focus on the key revenue generating functions of sport organizations. In order for sport organizations to be successful they must continuously create and sustain revenue-generating opportunities. Students in this minor will study sport marketing, sponsorship, ticket sales, promotions, brand management, and game-day operations with the goal of understanding how all of these areas contribute to the marketing and business success of a sport organization.